Jayson first played for OMS in 2013 following his prize-winning performance at the 2012 Leeds International Piano Competition. Since then, his career has taken wing and he divides his time between his native Australia and London. He has garnered world-wide awards including first prize at the 2014 Montreal International Competition. ​Octagon listeners have been privileged to have had an inside view (and in The Muse, a close-up one) of the progress of Jayson Gillham’s burgeoning career. He first played to us in 2013, after he came to our notice as one of the likely stars among the finalists at the Leeds Piano International Competition of the previous year. Then, he played Beethoven, Debussy and Chopin for us. We knew, already, that he was destined for great things and it was no surprise that he won first place at the 2014 Montreal Piano competition. The musical world then came knocking at the door. He was back in Watford in 2015 when his interest in the Romantic repertoire was revealed. And now he returned last Sunday with a programme skilfully blending his showmanship with a nod to the Baroque and its later manifestations. His reading of Handel’s Suite in E major was no classical facsimile – Jayson used all the qualities of the modern concert grand piano to bring a wide range of expression, yet observing fastidiously the spirit of Handel. Never has The Harmonious Blacksmith hammered or sung to such exhilarating effect. The Baroque link was maintained in Brahms’ Variations on a Theme of Handel. The theme itself is almost bland, but Brahms brings a wealth of variety and pace to the 25 Variations. Jayson has not only the technique but also a sense of the architecture to bring this amazing work to life. As the Variations unfolded, one could sense a mounting excitement (not a frequent feeling in concerts in these days of meticulously manicured performances) until he reached the final Fugue – and again turned the heat (and the volume) even higher. It was a magnificent performance which held us open mouthed in amazement. This work has always held a special place in Jayson’s repertoire – he played it his Final recital at the Royal Academy of Music where the illustrious panel of judges reported ‘The rare occasion when the word ‘phenomenal’ is appropriate…. Perhaps the finest final recital we can remember’. We might agree! The second half of the concert moved back in time to Schubert’s six Moments Musicaux, a beautifully varied collection of miniatures; the third with its evocation of a simple music-box rhythm, and the fourth with its toccata-like figuration (back to the Baroque?) were touchingly done. 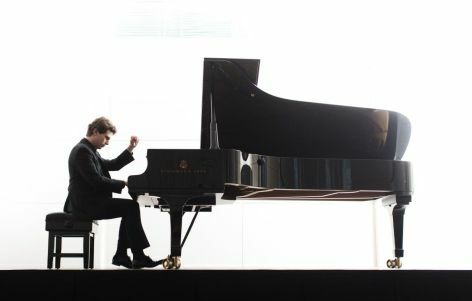 He concluded the recital with four Liszt transcriptions of well-known songs by Schubert. One is amazed at Liszt’s virtuosity in refiguring these simple songs for the full treatment, almost literally all stops out. But this would be nothing without the pianist who can carry it off. Of course, there was no doubt that Jayson would surmount each hurdle with not so much nonchalance but tongue in cheek humour. What a finish! Well it wasn’t, quite. Jayson has just released a CD of transcriptions of music by Bach from a variety of composers. His encore was Rachmaninov’s version of the Prelude to the E major Violin Partita (otherwise recognisable (just) as the introductory music for the BBC Radio 4’s ‘Counterpoint’ Quiz. We all probably feel we know Jayson as an old friend now. But his path to his present position is no less astonishing than his playing. He was born in 1986 in Dalby, a small town in Queensland in rich agricultural country, about 211 km north west of Brisbane. Dalby has a population of about 12,000, about the size of Croxley Green. It has the largest grain-receiving depot in Queensland, and hosts the largest one-day livestock market in Australia. Of classical music there was none. Neither of his parents were musical, but Jayson somehow took an early interest in the piano. A local teacher recognised something in Jayson, and he then went for lessons at the Brisbane Conservatoire from Leah Horwitz. This involved a weekly round trip of 450 km by car. At the age of 21, this young man from the outback then came to England and entered London’s Royal Academy of Music. His teacher there was Christopher Elton, a mentor to many fine British pianists, among them, Benjamin Grosvenor. Then his career began to take a more conventional shape.